In a study this week by YouGov BrandIndex, consumer perception of Netflix plummeted after the company announced a 60 percent increase in pricing by splitting streaming and DVD rentals. YouGov measures the buzz around brands on a scale from -100 to 100. 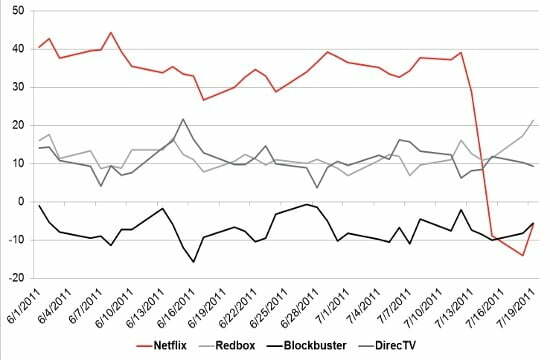 Previous to the pricing announcement, Netflix dominated rivals such as Redbox, DirecTV and Blockbuster with a 39.1 score on the chart. Since the announcement, consumer sentiment plummeted to -14.1 and Netflix is now tied with the previously bankrupt Blockbuster at -6. Rival Redbox has seen a sizable bump nearly doubling the perception of the brand without having to pursue any marketing. Blockbuster hasn’t seen any major bump in perception since offering a 30-day free trial for Blockbuster Total Access in response to the Netflix pricing. 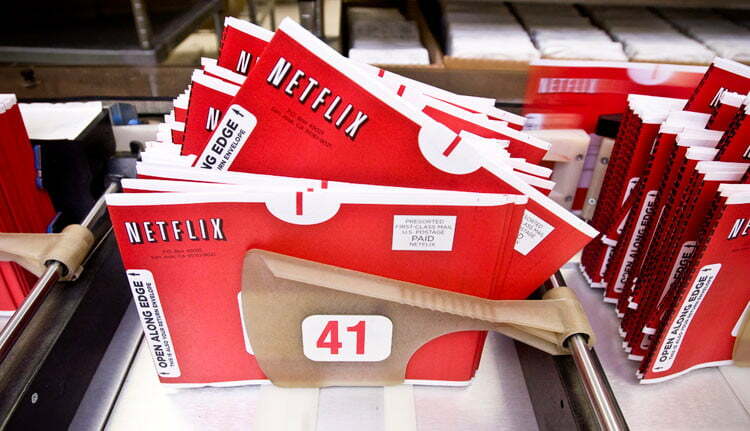 While the Total Access 1-disc-at-a-time plan is $2 more than Netflix’s new pricing structure, consumers have the ability to drop off rentals at physical store locations and there is no 28-day window on waiting for new releases. The plan also includes video game and Blu-ray rentals at no extra cost. However, Blockbuster’s recent announcement of another 200 store closures isn’t likely to help consumer’s opinion of the brand. Morgan Stanley also released a study this week regarding Netflix consumer loyalty after the price increase. Approximately 50 percent of people surveyed are currently using the $9.99 one-DVD-at-a-time plan with unlimited streaming. Of that segment, more than one in four planned on canceling Netflix service when the price increase goes into effect on September 1. Thirty one percent plan on switching to the streaming only plan while 13 percent are opting for the one-DVD-at-a-time plan. Only 15 percent are planning on upgrading to the more expensive $16 hybrid plan. Promised cancellations were a bit higher with consumer using the two-DVD-at-a-time plan, but fell to about 12 percent for those with three discs or more. If these numbers from Morgan Stanley represent an accurate depiction of Netflix’s subscriber base after September 1, the company will see a 22 percent decrease in subscription revenue and a 2 percent decrease in revenue per user. Morgan Stanley believes that the survey results could be skewed due to temporary consumer outrage over the price increase and actual cancellation numbers are likely smaller.